Product prices and availability are accurate as of 2019-04-19 05:11:36 UTC and are subject to change. Any price and availability information displayed on http://www.amazon.com/ at the time of purchase will apply to the purchase of this product. 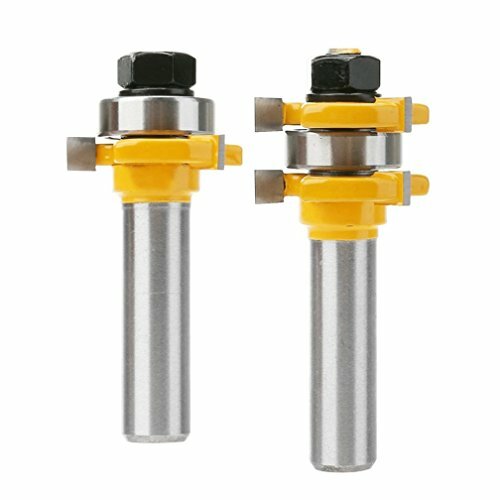 Solid hardened steel bodies with anti kickback design, Totally enclosed & lubricated Bearing. Build-up & heat resistant teflon coating, it could prevents build-up of sawdust, resin, and pitch. Industrial grade micro grain carbide blade, Cutters to slice smoothly into stock producing clean, splinter free. A tongue and groove joint is the ideal way to create flat, even joints for flooring, wainscoting, panels and tabletops. Even though some smaller tongue and groove bits can be utilized in a hand-held router the stability of a table will help keep the joint perfectly square. 1. 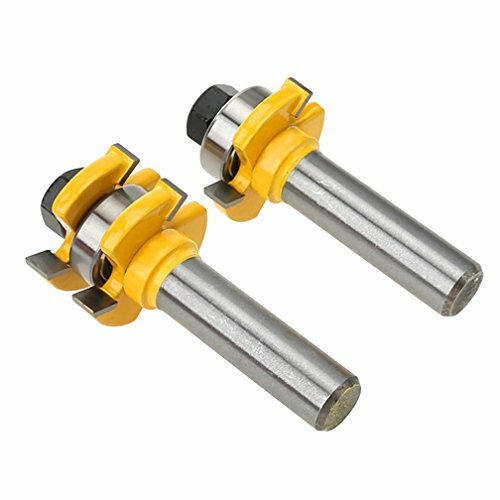 3 Teeth T-shape Tongue and groove router bits is 1/2-inch (12.7mm) Shank, teeth width: 1/4 inch(6.35mm), teeth depth: 1/4inch(6.35mm), suitable material thickness: 13-19mml, Overall Diameter: 1-3/8 inch. 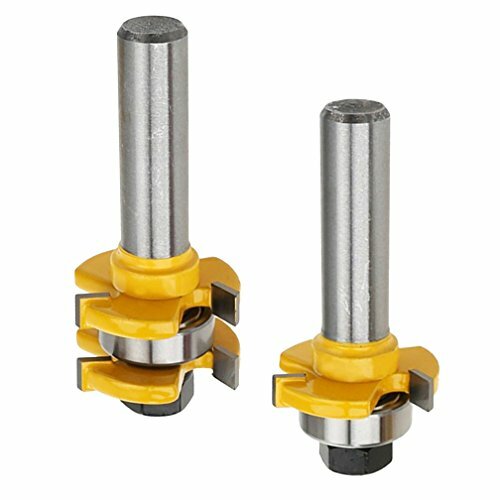 2.The material of this 3 Teeth T-shape tongue and groove router bits is solid hardened steel bodies with anti kickback design and build-up & heat resistant teflon coating.Industrial grade micro grain carbide blade.Incision smooth and tightly combined. 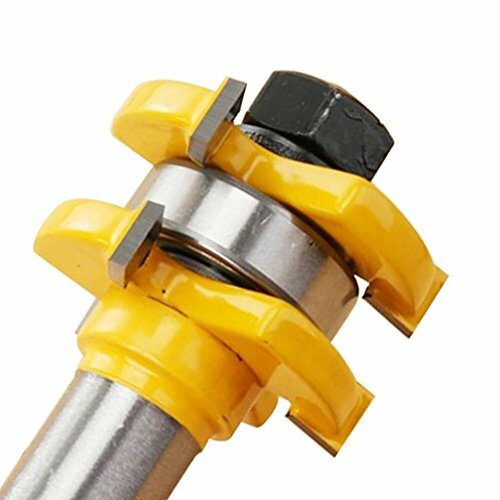 3.This 3 Teeth T-shape tongue and groove router bits can widely applications on woods, MDF, particle board, plywood compact panel.Note : Do not cutting ferrous metal and non wood materials, such as: steel, iron, sand, etc. 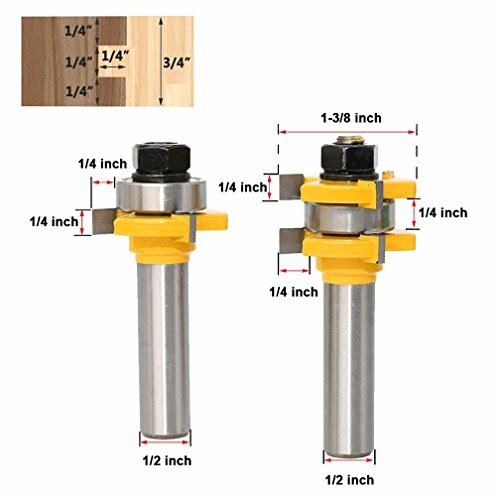 4.The 3 Teeth T-shape tongue and router bit tools can enhance your hardwood working performances and create beautifully handmade furniture on your own. Great for kitchen and bathroom doors, office cabinets, flooring tables, bedroom shelves, outdoor frames, walls and more. Perfect choice of professionals and hobbyists. 5.It's only use on table mount router, and it can not be used in electric drill & drill machines. Please select the correct casing size and use low speed!